DDA designs a website worthy of a web award. As the market for green products grows, it becomes easier for consumers to make environmentally conscious buying decisions. Consequently, manufacturers and distributors of eco-friendly products are devoting more and more resources to smart and well designed online and offline marketing tools to have an edge up on the competition. 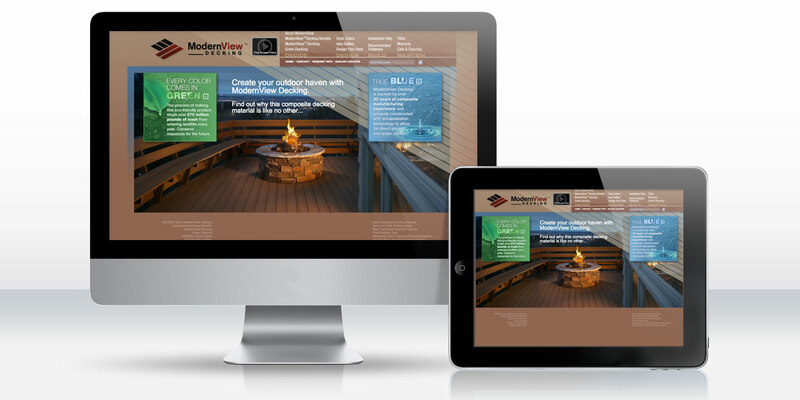 When Lumbermens Merchandising Corporation (LMC) acquired a new composite decking brand, the company turned to DDA for a website design that offered a high level of aesthetic appeal, valuable textual and visual content organized in an intuitive navigation system, and search engine optimization for high rankings on Google and other leading search engines. Using five of the best contractor pictures, DDA created animated vignettes in which movement was applied to a subtle element in each picture to draw in viewers. Animated elements included water, fire, wind, plant growth, and time progression—each representing aspects of our natural world. These animated scenes were the crux of the website and a complementary design was organically created. Not only are the five animated vignettes entertaining in and of themselves, but they serve as the backdrop for categorized search engine optimized (SEO) content. DDA produced 20 pages of SEO content rich with keywords and phrases directly relevant to “composite decking.” DDA turned key features of the ModernView™ Decking brand as discussed in early planning meetings into strong marketing messages prominently displayed throughout the website. Users can search by state or zip code for dealers that distribute ModernView™ Decking through a Dealer Locator tool custom-programmed by DDA. After the website was launched, LMC received countless compliments on the design from composite decking dealers based throughout the United States. The feedback was so positive, in fact, that Lumbermens is even considering submitting the website for a web award. At the conclusion of the project, LMC communicated to DDA, "you definitely beat our expectations with the animation features." Exceeding expectations is something we at DDA strive to do every day. The end result of this project more than pleased the client, but actually created a new type of online experience users will now come to expect. Subtle, but sophisticated, the animated scenes engage users and compel them to click throughout the site to see more. Although the site was launched on a newly acquired URL, it quickly earned high rankings on the first page of leading search engines for many terms centered on "composite decking." Long-term search engine optimization results look very promising.